A [Phoenix] town hall for liberal activists featuring two Democratic presidential candidates was interrupted by dozens of demonstrators on Saturday who shouted down the contenders and demanded they address criminal justice issues and police brutality. 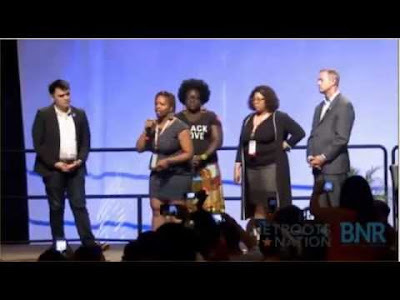 attend a public sit-down interview with journalist Jose Antonio Vargas in front of a left-leaning crowd here at the annual Netroots Nation conference, a gathering of progressives, when the tone of the program shifted just a few minutes into the event. O'Malley was answering questions from Vargas on stage when dozens of boisterous conference attendees flooded through a side door and shouted down the White House contender. "What side are you on my people?" they sang in unison as they approached. Tia Oso of the Black Alliance for Just Immigration, who represented the demonstrators, climbed onto the stage, secured a microphone, and delivered a speech while O'Malley looked on. "We are going to hold this space. We are going to acknowledge the names of black women who have died in police custody. And Governor O'Malley, we do have questions for you ... As the leader of this nation, will you advance a racial justice agenda that will dismantle -- not reform, not make progress -- but will begin to dismantle structural racism in the United States?" Below, dozens shouted several chants in unison. "Black lives matter! Black lives matter!" they shouted toward O'Malley, and began a call-and-repeat rallying cry that activists have been using in the wake of the death of 28-year-old Sandra Bland, who died in police custody last week. "If I die in police in custody!" one of the chants went, "Burn everything down! That's the only way mother******* like you listen!" Conference organizers begged them to allow O'Malley to respond. "I think all of us as Americans have a responsibility to recognize the pain and the grief throughout our country from all of the lives that have been lost to violence, whether that's violence at the hands at the police or whether that's violence at the hands of civilians," O'Malley said, before being interrupted again. "Don't generalize this s***!" one person shouted back. The demonstrators started shouting and booing again when O'Malley said: "Black lives matter. White lives matter. All lives matter." For saying all lives matter, O'Malley had to issue an apology. He left the stage changing: "Black lives matter! Black lives matter!" When Sanders approached the stage a moment later, the demonstrators continued. The candidate, a favorite of Netroots Nation, threatened to leave if they continued to interrupt him. "Black lives, of course, matter. I spent 50 years of my life fighting for civil rights and for dignity," he said. "But if you don't want me to be here, that's OK. I don't want to outscream people." Sanders proceeded to deliver his usual presidential stump speech over sporadic shouting from below. After talking over one another, Sanders eventually ditched pre-planned remarks and tried to address questions from demonstrators. "Black people are dying in this country because we have a criminal justice system which is out of control, a system in which over 50% of young African-American kids are unemployed," Sanders said. "It is estimated that a black baby born today has a one in four chance of ending up in the criminal justice system." When Sanders cited the Affordable Care Act as a law he supported that helped people of color by making health insurance more accessible, one man shouted, "we can't afford that!" Before Sanders finished speaking, many of the protesters walked out on him toward exit doors in the back. There should be zero tolerance for people who insist on interrupting events like this. They should have been immediately detained by police and escorted out of the building. Your free speech right does not include the right to interrupt the speech of other people. But from a political perspective that a Democratic presidential candidate felt compelled to apologize for saying "all lives matter" show how extremists have taken over the nomination process of the Democratic Party. Even a spokesperson for Netroots Nation couldn't bring herself to condemn the people who ruined the event stating: "Although we wish the candidates had more time to respond to the issues, what happened today is reflective of an urgent moment that America is facing today." Paul, you will be castigated for writing the truth in this report of the extremist out of touch leftists liberal Democrats when it comes to the divisive slogan "Black Lives Matter" as if "Asian Lives", and "White Lives" or "Spanish Lives" do not matter or the implication by leftists that Caucasians, Asians, the Spanish, etc., or any race other than "Black" are more meaningful. That a liberal Democrat like O'Malley is cowed by the antics of these rude, boorish, aggressive persons who shut down their is just stunning. We are more and more broken down into groups that the Statists use to create envy, hatred, and distrust. And for all that "hope" about a "change" for better race relations... we are turned into a house divided and there is a reason for that. Pretty funny and he can exit stage left....a loser before he even began. Free speech is so last century when it comes to "progressives" (a descriptor more easily swallowed than the accurate "extremist left liberals").